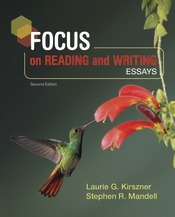 Focus on Reading and Writing: Essays provides thorough, integrated instruction on reading and writing essays and includes many effective features to help students make the connection between the reading and writing processes, including TEST—Kirszner and Mandell’s simple and effective reading and writing tool designed to help students gauge their progress. Kirszner and Mandell believe that students learn best when they try their hand at a new concept first with their own work. That’s why they designed the Focus on Reading and Writing strand throughout each chapter. The strand first prompts students to read and write, then learn essential concepts, and ultimately apply those concepts while re-reading and revising. With a complete grammar guide, supplementary online grammar practice through LaunchPad Solo for Readers and Writers, and 23 professional reading selections, this comprehensive text gets students reading, writing, and thinking critically in preparation for academic, career, and life success. The Second Edition strengthens and further integrates reading coverage throughout, helping improve students’ comprehension and ability to think critically as they read. An updated TEST feature now applies equally to understanding and analyzing readings as well as developing, drafting, and revising essays, a new annotated model has been added in Chapter 1, and new information has been added on identifying and formulating implied main ideas.